Thirty-eight selectively invited, prospective first-year students will arrive at Virginia Wesleyan today to participate in competition for the third cohort in the elite Batten Honors College (November 8-10). The second part of the competition, which will follow the same format, will occur February 7-9. This year’s cohort will come from a potential student pool of 20,000 eligible students, approximately 200 of whom completed a supplemental application process. Overall, 80 students with outstanding academic backgrounds are invited to compete each year for a seat in the Batten Honors College. The competition will begin with a welcome reception at the Virginia Aquarium & Marine Science Center and will continue Friday and Saturday with presentations, interviews, campus tours, class visits, and panel discussions. Participating students and their parents will also attend a reception Friday evening at Slover Library in downtown Norfolk. Twenty students will be selected to receive the Batten Fellowship, a prestigious scholarship renewable for four years and covering the full amount of tuition plus funding for an international study-away experience during the junior or senior year. The Batten Honors College will also recognize the academic merit and leadership potential of an additional 20 Shumadine Scholars, who will receive scholarships equal to two-thirds tuition. This selective academic program is made possible by generous support from Virginia Wesleyan University Trustee Emerita Jane P. Batten H'06 and her late husband, Frank Batten, Sr. Through small class sizes, personalized instruction and especially vigorous faculty-student interaction, the Batten Honors College is designed to prepare leaders and environmental stewards. The curriculum explores diverse disciplines within the natural sciences, humanities, social sciences, and mathematics. 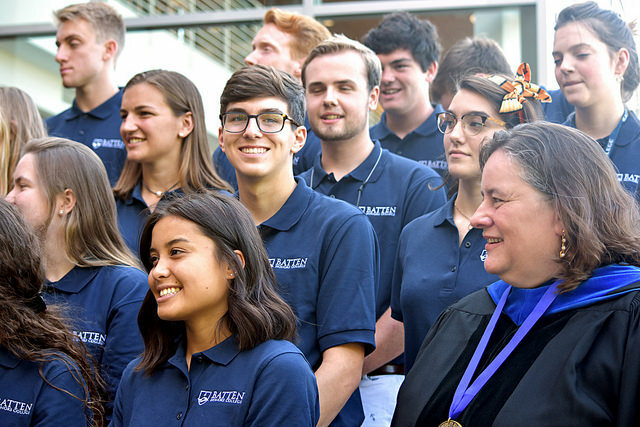 “Our goal through the Batten Honors College is to educate and graduate selectively chosen lifelong learners interested in shaping the future and taking action to improve the world,” said Dr. Miller.